What are Mugmates? I don't know. But Charles Addams suggests them and that's enough for me. It's amazing how badly you can suddenly want something that moments earlier you didn't even know existed. I don't get these because the fine print actually says "You can't buy them." I assume you're supposed to draw your own or something? So Rozum you don't have to covet these because they don't exist. The copy on this ad is so strange.. "Cout it be the eternal triangle? 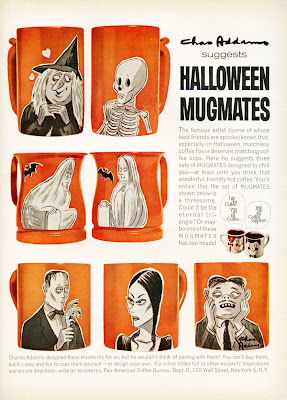 Or maybe one of these mugmates has two heads!"